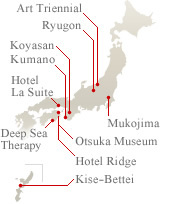 Utoco Deep Sea Therapy Center and Hotel was given birth at Muroto city in Shikoku Island as a result of an opportune encounter of Mr. Shu Uemura, a world renowned makeup artist, with Muroto deep sea water. Maintained at body temperature, Muroto deep sea water will revitalize your body and sprit with our spa programs and treatments. Please relax and enjoy the deep sea therapy with its unique beauty philosophy in the warm coastal climate of the Pacific Ocean. The collaboration of Mr.Shu Uemura and the French architect Henri Gueydan gave birth to an environment which surpasses conventional ideas. The concept of this 250 meter-long white building is "living with the ocean." 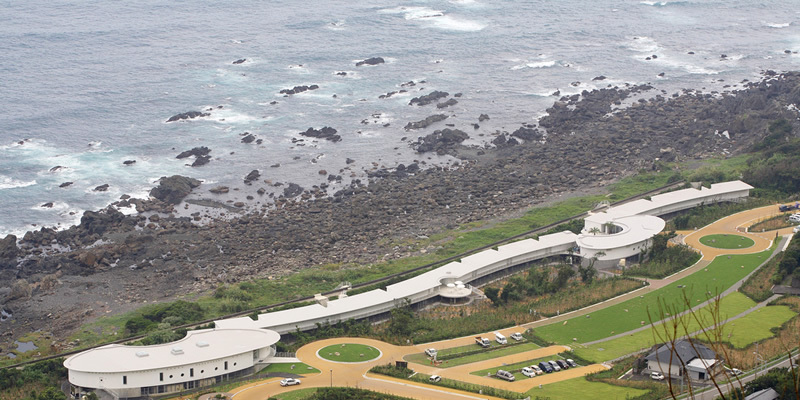 It is a new landmark in harmony with the Muroto ocean and mountain scenery.